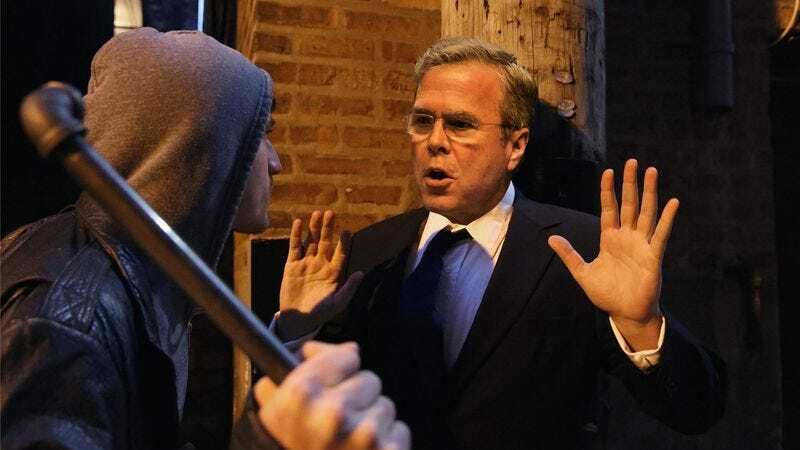 CHARLESTON, SC—Pleading for more time as the group of men advanced on him in a Charleston alleyway, GOP presidential candidate Jeb Bush assured a gang of pipe-wielding thugs Thursday that he would have the delegates he had promised them by next week, sources reported. “Whoa, whoa, easy, fellas. I know I’m late on this, but I’ll have everything you need after next weekend, I swear,” said the former Florida governor, begging the dark-clad men not to break his kneecaps for failing to place in the top five in a recent Rasmussen Reports nationwide poll of Republican voters. “I’ve only got the three delegates right now, but you know I’m good for the rest of it. My luck’s starting to turn around, I can feel it. I came real close to third place in New Hampshire, so things are starting to break my way. Please, just give me until the 20th and I swear I’ll make this right.” At press time, Bush was reportedly trying to conceal his freshly bandaged thumbs while greeting supporters at a rally in Columbia.